With the winter chill setting in, I invited a few friends over for a festive Soup Fiesta lunch. 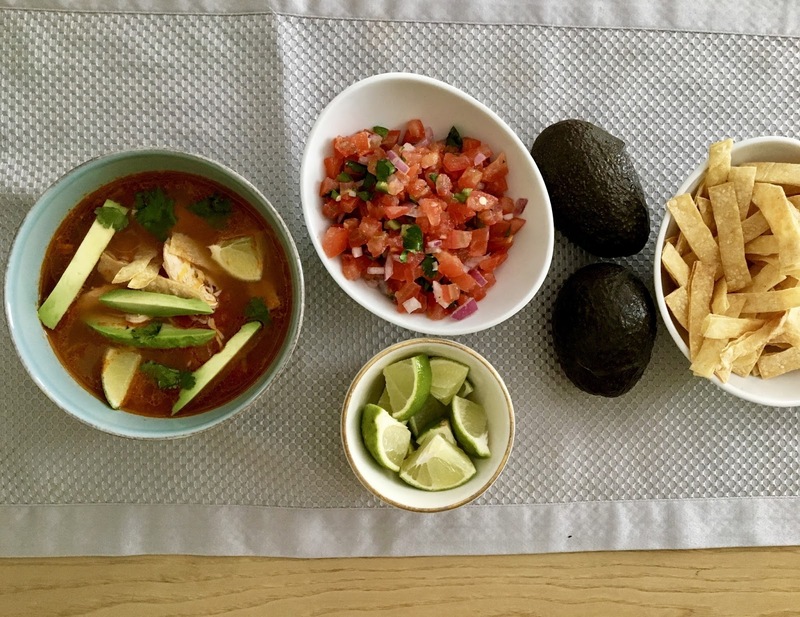 I whipped up a big pot of my Spicy Mexican Tortilla Chicken Soup with all of the fix-ins, and let my friends mingle and assemble their bowls of soup...with Margaritas in hand, of course. This soup is the ultimate body warming dish with a hot, steamy broth and spicy, zesty accents. The addition of creamy avocado slices, melted cheese, lime, and crispy tortilla strips creates a fun layering of flavors and textures. Seated in the living room with big bowls in our laps, a late afternoon siesta followed for many of us. Heat 1 T EVOO over medium-high heat. Add onions and cook for 3-5 minute, until translucent. Add garlic and cook for 2 more minutes. Add tomato paste, diced tomatoes (with liquid), jalapeños, chili powder, salt and pepper. Cook until liquid evaporates, about 2-3 minutes. Add broth, bring to a boil, then reduce heat to low. Let simmer atop the stove for at least 30 minutes to let the flavors meld. Meanwhile, toss the tortilla strips with the 1 t Canola oil on a lined baking sheet. Bake for 6-8 minutes until golden and toasty. Evenly divide the shredded chicken among 6 bowls. 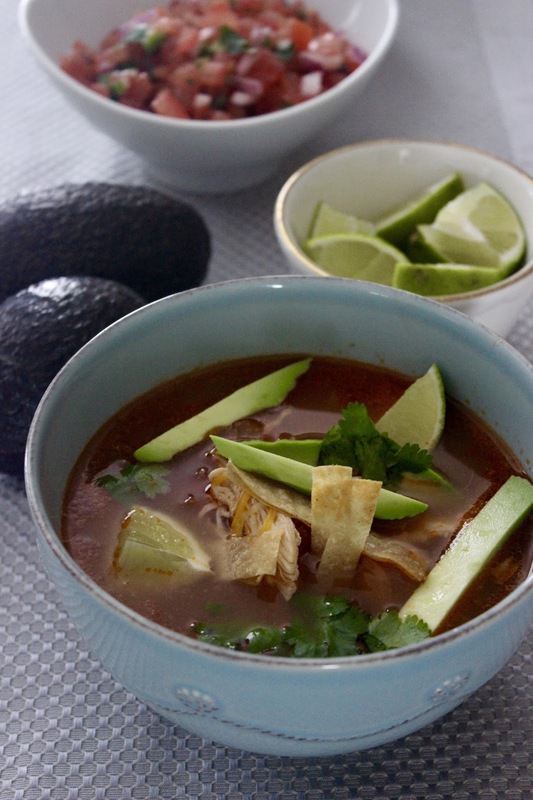 Ladle the broth on top and evenly distribute the avocado, grated cheese, tortilla strips, and cilantro on top. Add two lime wedges on the side. Serves 6. 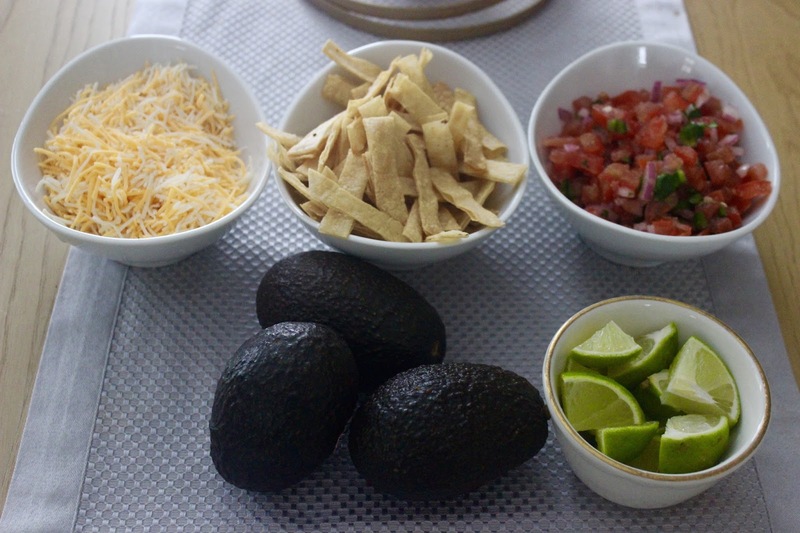 Have fun with the toppings - I sometimes add homemade pico de gallo, corn, black beans, or a spoonful of sour cream. This version is pretty spicy, so feel free to reduce or increase the seasoning to taste.